Bay Area natives and thrash metal band HATCHET recently completed the follow-up to 2013’s acclaimed Dawn Of The End (The End Records/ADA). Their third studio album, entitled Fear Beyond Lunacy, is set for release Fall 2015, and will debut the new HATCHET lineup behind founding member, vocalist and lead guitarist Julz Ramos: Clayton Cagle on guitar, Kody Barba on bass and Ben Smith on drums. The new members have injected the band with a surge of raw energy, and fans of HATCHET will be overly satisfied with this revived enthusiasm laid into the recordings. 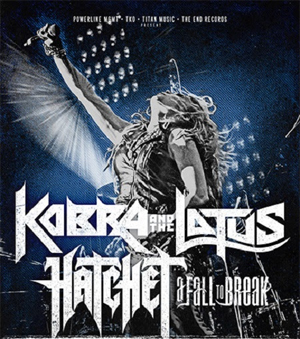 In advance of the album release, HATCHET will showcase the new lineup and preview select tracks from Fear Beyond Lunacy this August supporting KOBRA AND THE LOTUS, the female-fronted Canadian traditional metal/hard rock band that recently shared stages opening for KISS and DEF LEPPARD. Says Ramos, "HATCHET is excited to be taking part in this run of shows. This is another hard working band that is doing some cool things right now and it will be great to accompany them this August. This will be the first that the new HATCHET lineup hits the stage and we are beyond excited to play live after recording our latest album. People in attendance to these shows will get a sneak peak at a couple of our new songs. Stoked!" After self-releasing two demos, HATCHET's debut album, Awaiting Evil, was released in mid-2008 via Metal Blade Records. The album was well-received by thrash enthusiasts around the globe and proved a great beginning for the band. Since the release of the debut, Hatchet has completed three full DIY US tours as well as their 2013 sophomore effort through The End Records, which saw them touring with SOILWORK, JEFF LOOMIS, THREAT SIGNAL, BLACK TIDE, CELLADOR, EXMORTUS and FLOTSAM & JETSAM With a loyal and vast international fanbase, their Fall 2015 album is hotly anticipated by thrashers world-wide.